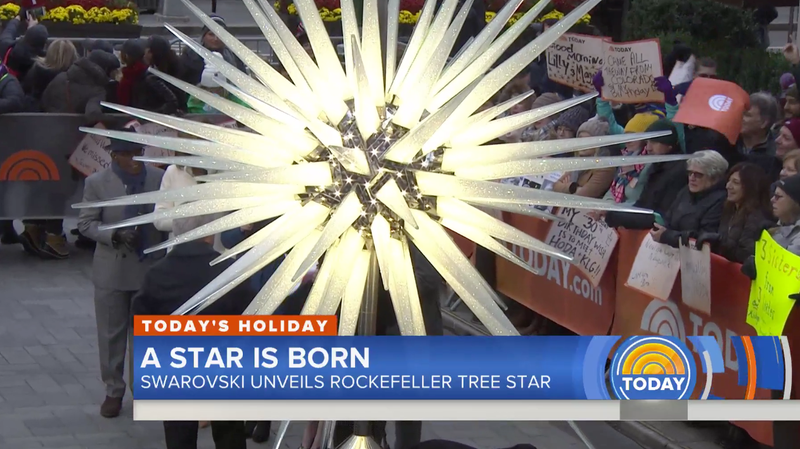 Behold the Beautiful, Terrible, Menacing New Rockefeller Center Christmas Tree Star! This year, the Rockefeller Center Christmas tree has a spectacular new 900-pound Swarovski star, made with 70 spikes and 3 million crystals. It may or may not be the terrible vessel for our strange new alien overlords, who will spring forth on Christmas morn demanding to be worshipped as gods. “It’s a renaissance of the star,” Mr. Libeskind said, referring to his design of a decoration that has a tradition as a symbol of hope. Inspired by the abstract concept of starlight and Leonardo da Vinci’s studies of geometric forms, Mr. Libeskind said he started out with sketches, which he then had to translate into the three-dimensional form. He also created a model of the star, which will sit in the plaza next to a holiday retail kiosk, so that observers can look at the design up close. The cast of the Today Show did a little segment with the star this morning, and strangely, nobody seemed alarmed? Even though the star itself was looming over them, spikes glowing in the weak winter sun. Perhaps even the clarity of HDTV declines to reveal professionally well-concealed terror. Save us, Hoda!